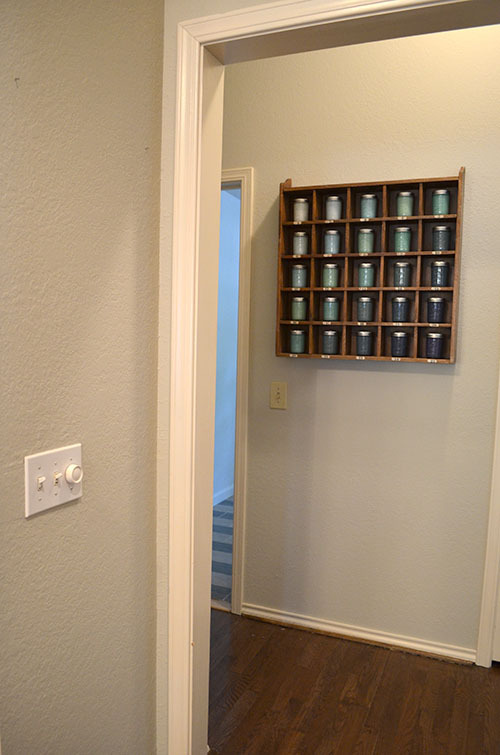 I've had this cubby organizer from the Pottery Barn outlet for more than a year now, and I finally found it a home in the new house. I threw some tiny bowls in a couple of the cubbies, but it was mostly empty. 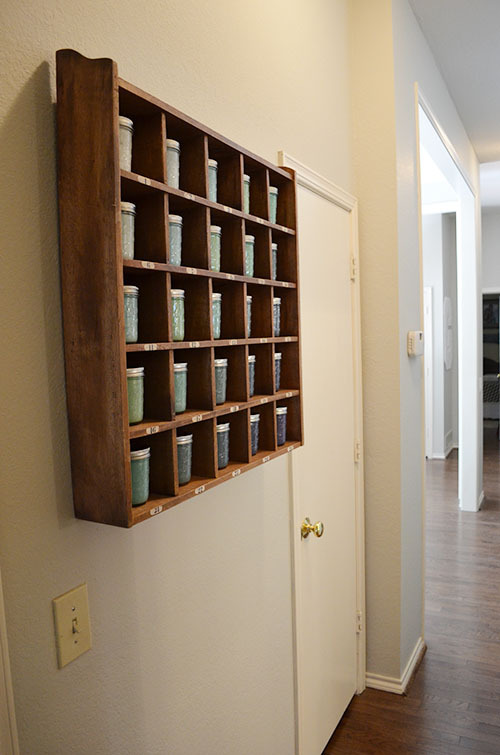 I'd been thinking about what I could do to make the most these cubbies when I suddenly remembered this amazing mason jar project by Emily Henderson. I was completely inspired and knew I could recreate this idea on a much smaller scale for some interesting wall art. Game on! 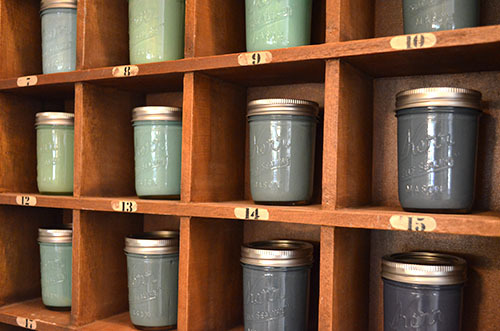 The first step was to find mason jars that would fit my cubbies. 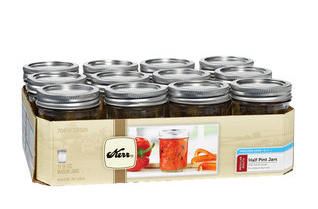 I went straight to the canning section at my local Walmart and found these adorable Kerr half-pint canning jars that would fit nicely. I needed 25 jars, but of course they came in packs of 12. I had to buy another pack of 12 just to get that one more jar I needed. What a pain! Maybe I'll try my hand at canning now that I've got 11 extra jars lying around. I can't remember the price and it doesn't say online, but I think it was about $8/dozen. Now that I had my jars, I had to decide on a color scheme. 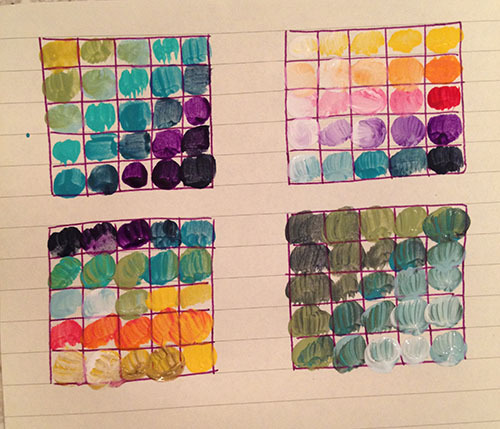 I decided to sample some of my craft paints to see which look I liked best. Of course I posted it to Instagram so I could take an informal poll of what everyone else liked best, too. I was torn between the top left and the bottom right, so the final result ended up being sort of a mix of the two. I have a hard time with bright warm colors like yellow and red– they just look a little out of place in my home full of cool, blue-ish grey colors. The process was super simple. 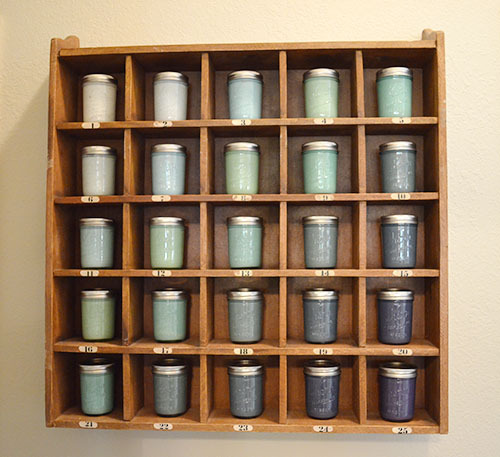 I used a paintbrush to put a coat of paint on the inside of each jar, making the colors darker as I went on. 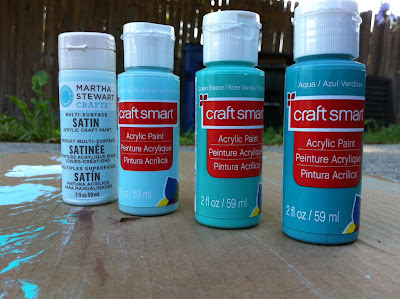 I mixed my blue, green and purple acrylic craft paints to get custom colors. Once those were finished, I was starting to get really excited about how they would look. The painting part probably took an hour, and it was a perfect project to do while watching TV. 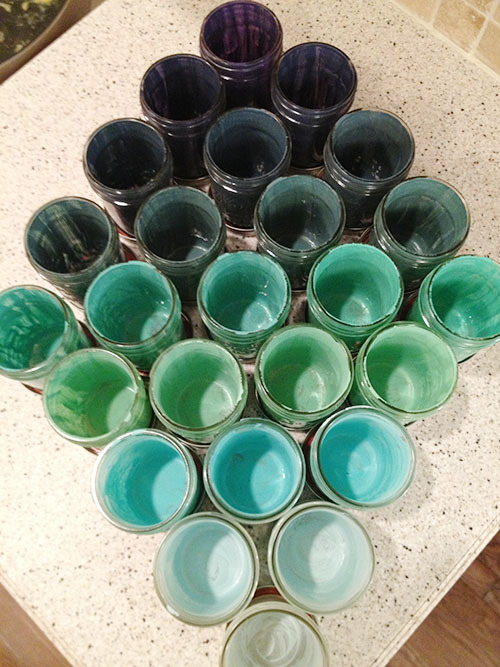 Another technique would be to dump some paint in each jar and roll it around until the inside was coated, but I decided that would waste too much paint. Perhaps the best $4 I ever spent? They're still going strong! 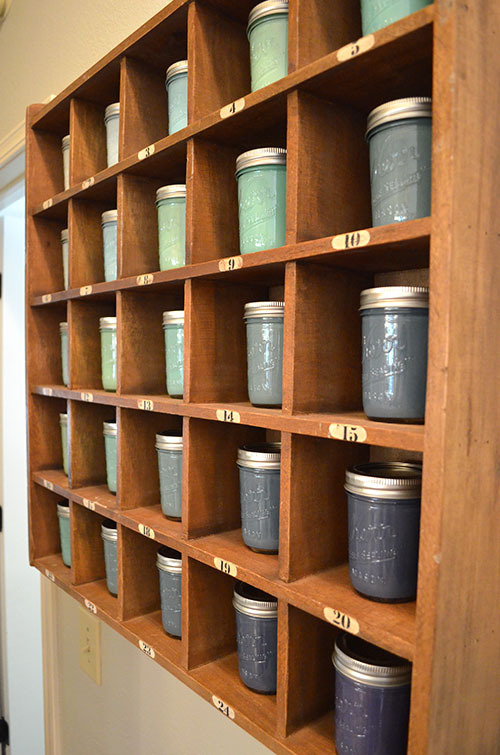 Once the jars dried, it was time for the fun part: arranging them in the cubbies! I'm thrilled with how this project came out. I feel like this little art installation is very much our style, which is nice because I think artwork should always help personalize your space and feel like "you." It makes me so much happier than the random bowls and cups I had stacked in those cubbies before. Emily painted the lids of her mason jars gold, but I opted to skip that step because I felt like the silver lids tied in better with the stainless steel appliances in our kitchen. Why does that matter? 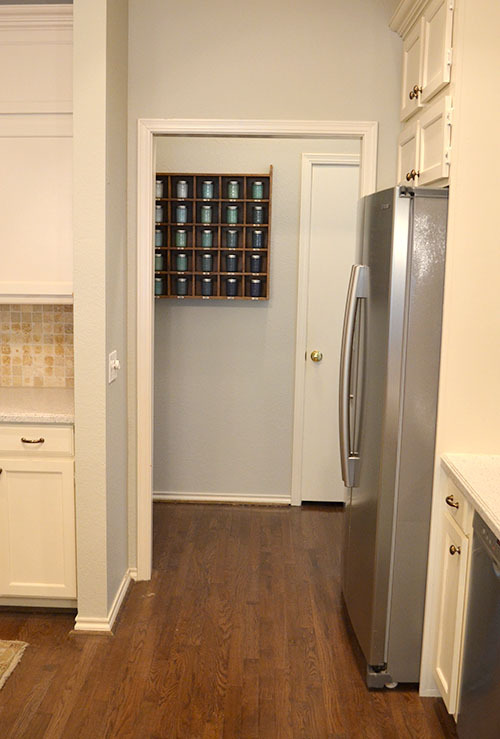 Because the best view of this cubby is achieved while standing in the kitchen, and you can always see our dang refrigerator jutting out into the space! And here's the view as you walk from the master bedroom toward the front door. 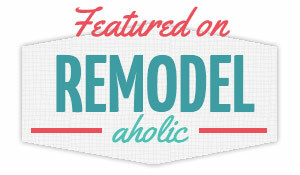 Can't wait to replace those gold doorknobs and dingy beige switch plates we have in the entire house! 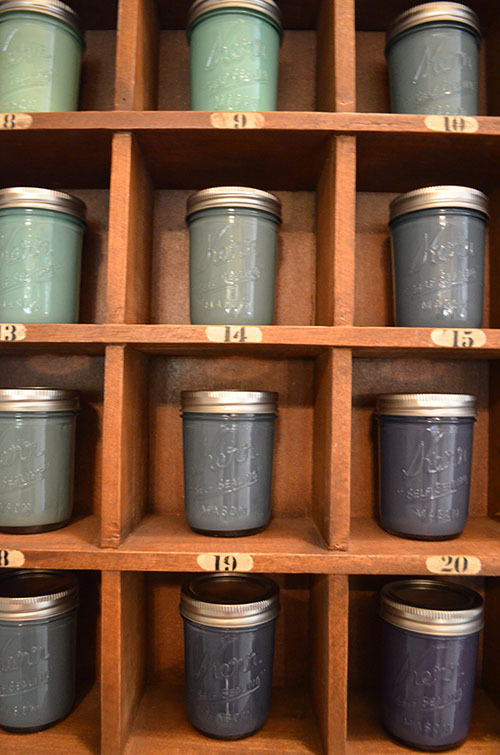 How about a bunch more pictures of pretty painted jars? I just love how they look with the glassy finish and opaque color on the inside. I was honestly surprised it was such an easy project. I figured I'd have to do a bunch of coats of paint, and then I might run out of paint and have to buy more, and that by the end of it I might regret how much of my time it took. Fortunately for me, they only needed one coat and were a piece of cake to paint. The hardest part was dragging myself through the Walmart doors in the first place because I always dread the crowds. But even that part was easier than I expected because my Walmart wasn't crowded and I ran through the express line in record time! Phew. Those of you who voted on my color choices via Instagram, what do you think? 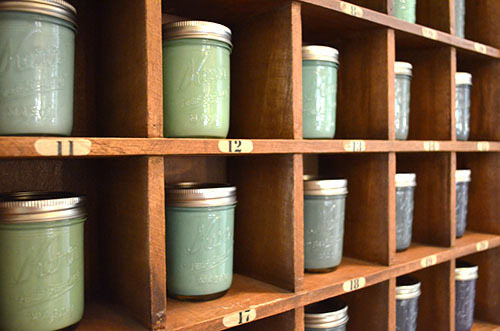 And what should I do with the rest of my little mason jars?